Kris Aquino poses with Constance Wu, the lead actress of the Hollywood movie Crazy Rich Asians. Anticipation and excitement are building for Crazy Rich Asians, the first Asian-cast led Hollywood movie to be shown in cinemas in 25 years. The last film to do so was 1993's The Joy Luck Club. Based on the best-selling novel Crazy Rich Asians by author Kevin Kwan, the film is largely based on the real-life posh Singaporean society. It revolves around the romance between a middle-class Chinese-American, Rachel Chu, and her ultra-rich Singaporean boyfriend, Nick Young. 1. 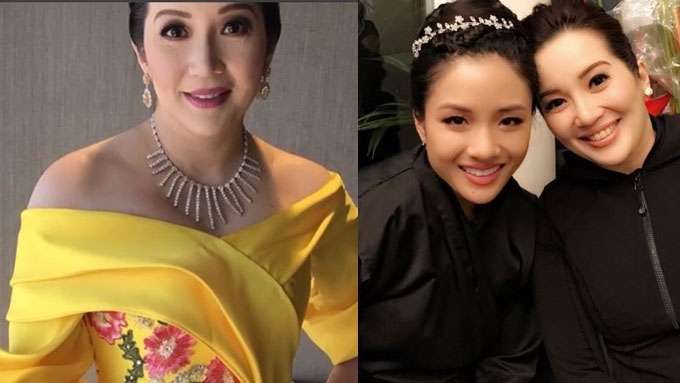 Kris Aquino had her own entourage while shooting Crazy Rich Asians. Chris also pointed out that Kris simply depicted the lifestyle that she has grown accustomed to. "All of us were acting and trying to dig deep into this life that we didn’t know, but she was just playing herself." In response, Kris clarified that she brought eight staff members, including her make-up artist, hair stylist, and fashion stylists. A report by Pilipino Star Ngayon indicated that Kris was visited by the P&G team based in Singapore. The Filipina actress, who is endorser of a detergent brand produced by the company, received flowers from P&G. Friends of her finance manager Nicko Falcis were also spotted with Kris and her other guests were executives of Unilever and General Mills. At the Hub Charity Ball for Kids in Hong Kong, someone paid US$ 200,000 (PHP 10.72 million pesos) for a walk-on role in the movie! Crazy Rich Asians author Kevin Kwan admits that plastic surgery for fish really exists! In Singapore, there is a master plastic surgeon for arowanas. These collectors’ fish can cost up to $300,000 each, depending on the color, and people want their pets to look as perfect as possible. Feng shui was used to determine the movie’s playdate. The movie’s opening date was chosen because it’s an auspicious one. In Chinese culture, eight is a lucky number, so the movie will open on the eighth month of the year 2018. 5. Kwan hails from a “crazy rich” family himself. Much like the lead character, Nick Young, Kwan traces his genealogy to three extremely wealthy Chinese families in Singapore: the Kwans, Ohs, and Hus. His paternal great-grandfather was one of the founders of one of Singapore’s biggest banks, the Oversea-Chinese Banking Corporation. 6. Kwan could have bought his own island if they accepted offer from Netflix. Kwan and Crazy Rich Asians film director Jon M. Chu turned down a colossal Netflix offer to distribute the movie in favor of releasing it in movie theatres—to prove that Asian stories can be told on the big screen. According to The Hollywood Reporter, Netflix offered more money to buy Crazy Rich Asians, much bigger than the Warner Bros. offer. "I could have moved to an island and never worked another day," Kwan said about the huge offer from Netflix.